Recently launched at Hodgdon Yachts in East Boothbay, ME, the 100-foot super maxi Comanche, built for seasoned yachtsman Jim Clark, has been sailing the waters off Newport, RI. 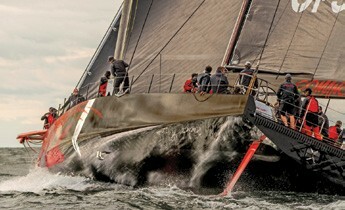 Testing has been ongoing in anticipation of getting right to work breaking records in offshore races. The first such event that Comanche is set to participate in, with world champion sailor and North Sails President Ken Read as skipper, is the Rolex Sydney to Hobart Yacht Race. Starting December 26, the 628-nautical mile race will be the first test of this boat’s awesome power against many of the world’s fastest super maxis. Additionally, Clark has his sights set on breaking the Transatlantic record.